Luxembourg’s national anthem is the second-hardest to master after China’s, a Canadian schoolgirl who learned 80 national anthems has concluded. 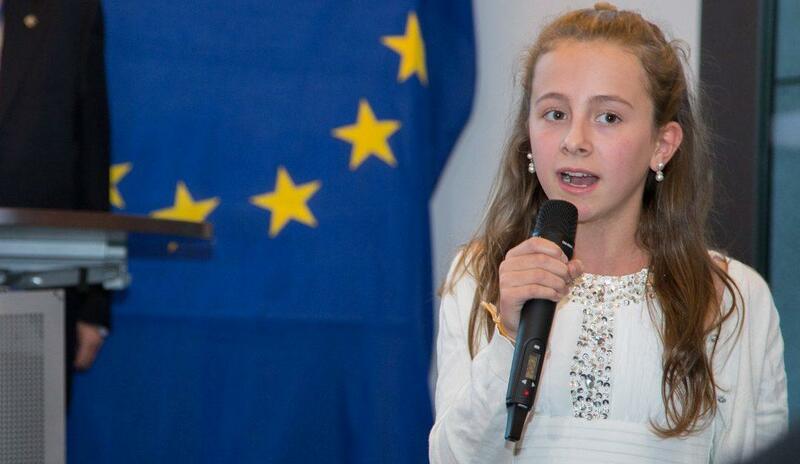 Despite it being difficult to learn, 11-year-old Capri Everitt pulled off the amazing feat when she sang a pitch-perfect rendition of “Ons Heemecht” at a children’s home in Rosport and then at the World Peace Forum gala in Luxembourg this week. Luxembourg was the 56th out of 80 countries the talented youngster is stopping off at over nine months to raise money for the charity “SOS Villages d’Enfants”. Capri has learned the national anthems of each country and, accompanied by her brother, Bowen, and parents, she performs the songs with children in each country to a professional standard. “Many children in third world countries don’t know famous pop songs. By singing the national anthem, I plan to get as many children as possible to sing with me,” Capri explained. The Everitt family began the 80 Anthems musical odyssey in November last year, renting out their home and signing the children up for homeschooling. They plotted a schedule that would take them to almost every continent and, before leaving, Capri learned the 80 national anthems she would sing in 41 different languages. However, unable to track down a Luxembourger in Vancouver, Capri studied the anthem via YouTube and got local coaching when she arrived in the Grand Duchy. The family’s epic tour is due to end with a bang in August when Capri sings at two major league baseball games in Washington DC and Toronto. Capri, for whom the anthems are now engrained in her memory, said she did expect life to be dull after such an exciting tour. “We’re going to write a book. And I love speaking so hopefully we will do talks,” she said. Capri is also selling a CD compilation of all the anthems she has and will sing with all proceeds going to SOS Vilages d’Enfants.